The Indus Valley Civilization prospered around 4700 years ago. 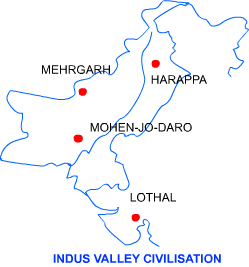 The cities of that period flourished mainly in the valley of the river Indus. Hence, it was called the Indus Valley Civilization. Harappa was the first site of this civilization to be discovered. Hence, this is also called the Harappan Civilization. Around the same time, the river valley civilizations flourished in many other parts of the world. The Mesopotamian Civilization was near the Tigris-Euphrates river system. The civilization in China was near the Huang ho river. The civilization in Egypt was near the Nile. Harappa is in modern day Pakistan. This site was accidentally discovered. The East India Company was doing the construction of railway lines in 1856. Initially, the construction workers thought the ruins to be of some ordinary old city. The bricks from the site were used for the construction. It was about 80 years ago that archaeologists could realize that it was an ancient city. Mohenjo–Daro, Kalibangan, Lothal and Dholavira are some other important sites of the Indus Valley Civilization. About 150 sites of this civilization have been discovered till date. Most of the sites of this civilization are in modern day Pakistan. Some of the sites are in India, e.g. Kalibangan (Northern Rajasthan), Banavali (Haryana), Dholavira (Gujarat) and Lothal (Gujarat). After excavations from different sites, it has become clear that this civilization was spread over major parts of western India and Pakistan and some parts of Afghanistan. These cities show immaculate town planning. The city of Harappa was divided into two parts, i.e. western and eastern parts. The western part of the city was smaller but higher. The higher part was called the citadel. The citadel contained some special structures. The eastern part of the city was larger but lower. The lower part was called the lower city. A huge tank has been found within the citadel. This has been named as the Great Bath by archaeologists. This was made from baked bricks. Its walls and floors were sealed by naturally occurring tar. There were steps on all sides so that people could easily go down the tank. Rooms were built around it. The historians guess that this was used by the ruling classes; for ritual bath. Rich people lived in the upper part of the city. Workers lived in the lower part of the city. Houses and other structures were made of baked bricks. Bricks were of uniform size. This means that the people of Harappa had developed good workmanship. Bricks were joined in interlocking pattern. This gave more strength to the building. Roads were paved with bricks. The road intersected at right angles. The drainage system was properly planned. Drain from each house was connected to the drains in the streets. Drains were covered with stone slabs. Inspection holes were made at frequent intervals on the drain. The walls of the houses were strong and thick. Some of the houses were two storey high. This shows the well developed architecture in those days. A house normally had a kitchen, a bathroom and a large courtyard. Wells were also present in most of the houses; to ensure continuous supply of water. In the cities of the Indus Valley Civilization; a large granary has been found. Charred grains have been found in these granaries. This shows that food grain production was surplus during this period. Historians also guess that taxes were collected in the form of grains. Grains collected as tax were stored in such large granaries.